Part of our created humanness is that we form natural emotional and psychological attachments to people and things. But when lose them—such as in the death of a loved one—we experience the process of grief. The greater the loss the deeper the grief. Our problem comes when we don't process our grief allowing proper healing from the loss to occur. We end up stuck. Some inadequate responses include not grieving at all, delayed grief, incomplete grief, and responding with bitterness. God accepts the fact that we grieve and that it is part of the human condition. Paul commanded, “Mourn with those who mourn” (Romans 12:15). He also wrote we grieve but not in the same manner as those who do not have hope (1 Thessalonians 4:13). When we have Jesus Christ as our Saviour, we still grieve, but the nature of that grief is changed so that we grieve with the sure hope of heaven and the restoration of all things. God knows grief is normal and His answer to us is, “Blessed are those who mourn, for they will be comforted” (Matthew 5:4). Isaiah 53:3-4 describes Jesus as “A man of sorrows and acquainted with grief.” In John 11:33-35 Jesus wept greatly at the death of his friend Lazarus. When John the Baptist was killed Jesus withdrew to a solitary place (Matthew 14:13). Seeing Jesus grieve shows us grief is not sin and it is OK to feel pain at loss. Few of us have trouble picturing Jesus in human form. And we can easily relate to the image of God as our Father. But the Holy Spirit is often a lot more difficult to understand! Chuck Swindoll describes the role of the Holy Spirit in your life in this message. Picture someone who walks in integrity, loves God, and treats others with kindness and grace and mercy…and then, suddenly, loses everything. How could this happen? And could it happen to you? Who knows? The experience may be just around the corner. For most of my life God has been teaching me to release my grip on everything I hold tightly. It’s a process that began when I was 13. Part of our created humanness is that we form natural emotional and psychological attachments to people and things. 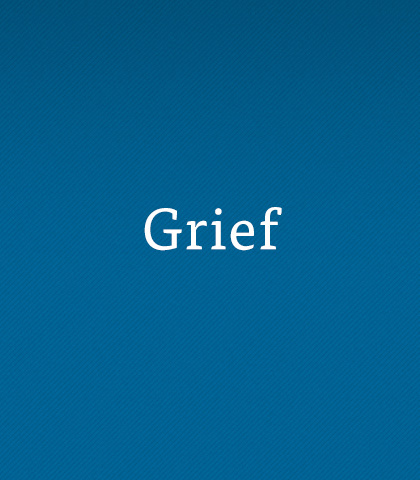 But when lose them—such as in the death of a loved one—we experience the process of grief.